Caroline Martel is an artist. 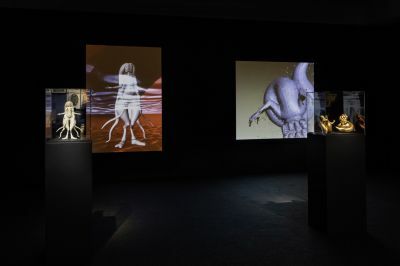 The exhibition Cmptr Grrrlz brings together more than 20 international artistic positions that negotiate the complex relationship between gender and technology in past and present. Computer Grlz deals with the link between women and technology from the first human computers to the current revival of technofeminist movements. An illustrated timeline with over 200 entries covers these developments from the 18th century to the present. Invited are artists, hackers, makers and researchers who are working on how to think differently about technology: by questioning the gender bias in big data and Artificial Intelligence, promoting an open and diversified Internet, and designing utopian technologies. Computer Grrrls is an exhibition by HMKV (Hartware MedienKunstVerein), Dortmund (DE), in coproduction with La Gaîté Lyrique, Paris (FR). The participating artists come from 16 countries: Australia, Canada, China, France, Germany, Greece, Iran, Italy, Mexico, the Netherlands, Russia, Switzerland, Turkey, UK, USA, and Yugoslavia/Serbia. Following the exhibition at HMKV Dortmund, the project will move to La Gaîté Lyrique in Paris in the spring of 2019, and in summer 2019 to MU in Eindhoven. In all places there will be film screenings, tours with the curators, artist talks and experimental workshops. The exhibition is dedicated to Nathalie Magnan (1956-2016).